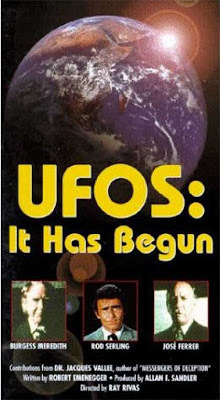 This documentary came out in 1979 and features Dr. Jacques Vallee, presented by Rod Serling and written by Robert Emenegger. Yes, its the same person who was pretty close to uncovering the reality behind the alleged reports about the landing of a UFO at Holloman AFB. He also appears shortly in the one about the Presidential knowledge about UFO's, part of the History Channel's UFO Files Series ! It's a pretty good video, and should definitely go into the video library of anyone interested in the scientific study of UFOs.